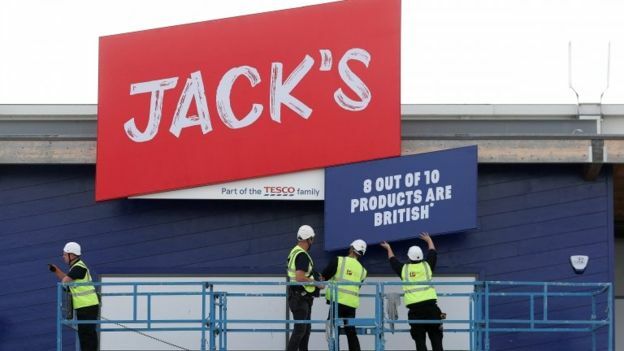 Tesco has unveiled its new discount chain called Jack's that aims to tackle the rising threat posed by German rivals Aldi and Lidl. The first store is in a mothballed former Tesco store in Chatteris, Cambridgeshire. Another outlet in Immingham, Lincolnshire also opens on Thursday. Between 10 and 15 stores are planned for new locations, next to existing Tesco stores, and a small number of converted Tesco stores. Chief executive Dave Lewis claimed that Jack's - named after Tesco founder Sir Jack Cohen - would be cheaper than Aldi or Lidl. "We have been thinking about what customers want, and bringing it to them in the most cost-effective, value-orientated way possible," he told the BBC. "The objective is to be the lowest cost for customers." Jack's stores will sell 2,600 products - far fewer than the 35,000 carried by a Tesco supermarket - with 1,800 branded "Jack's". By comparison, Aldi sells around 1,800 products. It is understood that Aldi will review Jack's prices where the stores open and adjust them if required.